The Polo Beach Club... Whether you are planning a romantic getaway for two or a family vacation, you will find everything you need at this prime location! The Polo Beach Club is a non-smoking 8 story building which is nestled on the water's edge with silhouettes of neighboring islands in the distance and spectacular Maui sunsets. Our almost privately situated beach has been rated one of the top 10 beaches in all of Hawaii and is located right next to several 5 star resorts, world renowned championship golf courses, and luxury shopping. All units are 2 bedroom and 2 bath and are individually owned. Our unit has been remodeled and upgraded with top of the line appliances, granite counter tops, over stuffed ultra-suede sofas, and beautiful Tommy Bahama furnishings. It is well-stocked and well-furnished. Our 5 star condo and is ranked in the top bracket of most desirable condos to rent in all of South Maui. Also, for your convenience and to make things a little easier and more comfortable, we have provided internet access in our unit which will be available to you. 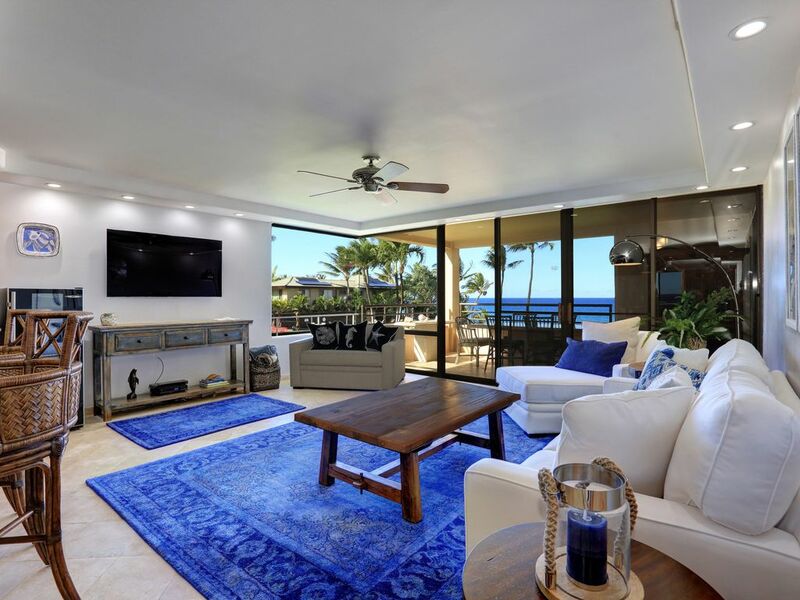 Our unit is located on the second floor, pool and barbecue side of the building with a tremendous and expansive view of the ocean and our crescent shaped white sand beach, looking out to the island of Molokini with views of Lanai and Ko'oholawe. The convenient location of our unit gives you easy access to the beach, pool area and BBQ. This luxury condo boasts a host of amenities. Elegantly furnished, this property comes complete with fresh linens, a full kitchen stocked with dry goods, staples, and everything you will need for meal preparation. There is even a herb garden available for guests who enjoy using fresh spices when preparing meals! Maid service is also available upon request. From enjoying a romantic dinner watching the sunset from the lanai, or walking the beautifully landscaped grounds enjoying the native plants and flowers, there is something for everyone in this location. The sparkling pool and spa are open daily from 9:00 a.m. until 10:00 p.m. for sunbathing and swimming, or perhaps snorkeling in the crystal clear waters off the private beach would be more to your liking. Whatever your preferences, you are sure to find something here for every taste. Awesome stay in the best condo which had everything. Great location and accommodations! Loved it. Will be back! This was our fist visit to Maui and staying at Polo Beach added such an element of relaxation for us it was difficult to leave. Walking through the door when we arrived, we all just stopped and stared out the windows - it's literally steps from the beach. The condo is beautifully decorated and stocked with everything you need during your stay, which is quite surprising as most condos leave you needing more supplies within 24 hours. Knowing most people are traveling from the mainland to visit, they also have everything you'll need for the beach - a huge plus when you're traveling with kids. The owner was very responsive to our questions, and very accommodating during our stay. If you're traveling to Maui, I would highly recommend booking this condo. It's in the perfect location, close to The Four Seasons and Grand Wailea, great restaurants and shopping - but it's private enough you can completely unwind. Perfect and peaceful getaway in Maui! The apartment is ideally located in a quiet building in Wailea set on a beautiful beach along with a pool and whirlpool on the property. It was very clean, beautifully furnished and perfect size for our family of four. We have been to Maui several times and this place tops them all. The owners have taken exceptional care of this palce and thought of many of the small things that help make your stay away from home better. The place was well organized and there were most everything you would need for your stay. Paper plates, spices, cards, towels and many more. Polo beach is a great spot and this is a great place to stay! The perfect place to stay!!! The condo was exactly the way it was pictured. Very clean. Everything here that we needed. All the appliances worked. Plenty of toilet paper, bar soap, trash bags etc. Loved the washer and dryer in the unit. Can’t wait to return. Michael was great to work with. Sunday after Thanksgiving to December 15 is Standard Rate. 10% discount for stays of two weeks or longer, not during Holiday Season. Contact us for our special LAST MINUTE BOOKING RATE starting at $295 per night. Additionally, our cancellation policy is 50% refund if cancelled 90 days, or more, prior to arrival. No refund if cancelled within 90 days of arrival date unless owners are able to re-book.